View my Web-Sites & Profiles to Contact me . Well, it is so long time that I'm using social networks, the 1st one was Orkut four years ago and a year ago I started using Facebook. I don't want compare them, my subject is something else, but as a personal opinion Facebook is really great invention as everybody knows it. It's about three days that I've felt in a large bunch of these networks and my huge interest to join them and test them. I tested about 5 of them in just one day. The great things here are the APIs which connect all of them together, even your Yahoo!, Google, AOL and etc. This is why I inserted '++' in the Title. You know, this is the Cloud. A social cloud which everybody can use in his own method, Social or Professional. As I read in Opera FAQ this technology shakes up the old client-server computing model of the Web. In Unite each computer become a server and also the client too. There, you can share anything that you want such as photos, notes, videos, applications and streaming MP3s and chatting or managing a conference too. It means that there is no need of uploading anything in an outer server and wasting the time to do so. But the weakness here is that the server computer should be on and connected to the Internet. For example, I've shared one of my photos, as that's in my system's HDD, if somebody wanna see the photo, my computer has to be on. I think Cloud is better again. As I was web-surfing I found that there are some EXPOs which are held specially for Cloud Computing around the world like what was in Santa Clara. I found it a nice way to introduce and inform the society and public about Cloud Computing and letting them to know the benefits of C2. I think if they everyone knows the great values of C2 it would make kind of a great deal that will help Clod Computing to grow faster than before and profits everybody. Here it's the duty of IT Pros. to consider this important thing and start public work. Also publishing simple Docs. and articles will help a lot. I think in order of doing so, the 1st point to recognize is organizing the Goals. Means what we want from Cloud Computing and what are the goals that we should introduce. Then managing how the process should be started and continue and what are our plans . . . And then what are our needs. I think the main requirement is just Brainstorm, which will lead to everything we want. I am counting the days for living in Cloudy World. And the World goes On and on . . .
Microsof Cloud Os, Azure, reaches general availability stage. Finally, I've finished my term exams and ready to start blogging again. And it's about Azure, its 1st show up and and its general availability stage now. For the 1st time, in October 28th, Microsoft launched Windows Azure for Cloud at Microsoft Professional Developers Conference in Los Angeles. As what they discussed there, Azure is a platform for developers, Windows Azure plays host to the .Net Framework, SQL Server, SharePoint, Dynamics CRM, and an offering called Live Services, which, according to Chief Software Architect Ray Ozzie, will extend Azure services "outward" to connect with locally running Microsoft software. Using this rich environment, developers will be able to build and deploy Web applications and services running on Microsoft's worldwide infrastructure of datacenters. Windows Azure "is a scalable hosting environment for you to deploy your apps in our cloud," said Microsoft corporate vice president Amitabh Srivastava, one of the key players behind the platform. "Windows Azure is a new Windows offering at the Web tier of computing," Ozzie said. "This represents a significant extension" of the Windows computing platform, he said. Cloud-based developer capabilities are combined with storage, computational, and network infrastructure services. 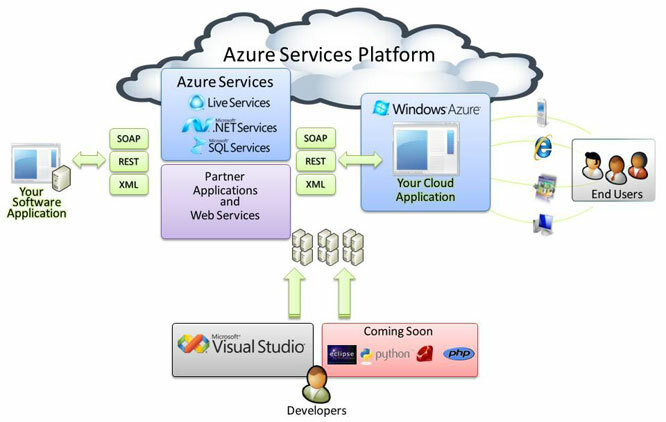 A limited Community Technology Preview of the Azure Services Platform is being made available at PDC. A road map for Azure is set to be revealed in 2009. About two days ago, one of my best friends, Amin Gholami, suggested me a link from Microsoft e-Book Center which was referring to an e-Book of Cloud Computing. I read and found it interesting. It's about basics of C2 and what Microsoft has described it. - Cost Savings of C2 depends on how we manage it, also it may add more costs to our business. - One of the Concerns about C2 is the security, because sometimes we are sending information to a third party. * Remember you need SilverLight view this page. What are Gartner predictions for IT ? Gartner, Inc. has highlighted the key predictions that herald long-term changes in approach for IT organizations and the people they serve for 2010 and beyond. Gartner's top predictions for 2010 showcase the trends and events that will change the nature of business today and beyond. The Research indicates that 20 percent of businesses will dump all assets of IT. By the shift of companies toward Cloud Computing and its services, there should be a great decrease in the need of staffs and also great hardware which lead to shrinkage of costs. But it's not just Cloud Computing that is driving a movement toward "decrease IT hardware assets". Also Virtualization and employees using personal desktops and laptops reduce the need for company-owned hardware. The report doesn't say exactly how a world in which 20 percent of IT organizations own no hardware will be able to deal with rapidly growing data storage needs. IDC has found that the amount of digital information created and replicated worldwide is growing at 60 percent each year, so presumably cloud-based storage services will help the IT world cope with this problem. - The leader of Social Networking will be Facebook by 2012. - By 2014, most IT business cases will include carbon remediation costs. - In 2012, 60 percent of a new PC's total life greenhouse gas emissions will have occurred before the user first turns the machine on. - By 2015, more than $250 billion will be spending Worldwide in Internet Marketing. - Mobile Phones will overtake PCs as the most common Web Access device in 2013. * At all, I think the shrinkage in the costs is the greatest benefit of Cloud Computing. Because, therefore we can divide the remained budget in more programs. Or also it could be used for public works or advertising. Wherever we use the remained budget, is better than spending it for storage or the salary of overplus employees. I was thinking that how long would Cloud Computing go. What do You think? As I'm surfing webs and reading news about all over the world, mostly America and Europe and also East Asian countries such as Japan or Korea, are working more on C2. Even in Iran it has became kind of a concern to start Cloud Computing as what I'm trying to know how. Here I mention some of my predictions and my researches in the Web about Cloud computing in the new year, 2010 . Well,as I know, SaaS (Software as a Service) is aged about 10 years and the applications were built in the static web tend to have a stilted user experience. But new applications will be more interactive and more user-friendly.Also there maybe be offline Cloud Applications as what Google has mentioned about Chrome, that there will be offline OS after 1st results and releases. New applications will use true and real elasticity which many Saas Apps. still cannot offer. It's all ready happening that the major technologies of the year - Cloud Computing and Social Media - are getting the World Business in their hands. I can mention some great companies such as Salesforce and the Oracle CRM which are became more social. Also with the expanded coverage of Facebook,Twitter,Digg and etc. advertising and commercials are getting more social and in touch. Two days ago I read about it in InfoWorld that Vint Cerf one of the desigers of TCP/IP protocols, emphasize on the need of some standards for Data Portability in the Cloud. As he said, for example in transfering data form Cloud A to Cloud B, there should be some standards that specify the format of Data and how the transfer should be processed. We decided to distribute and use cloud Computing in VSAT technology. As Mr.Jebelli Mentioned in his IT-Cloud blog , VSAT a is kind of tiny terminal with lots of uses such as what is used in Banking Connections. For more please take a look at his blog.